I hate cleaning. I like to keep a tidy house in case people drop by, but a full clean is torture. I was keeping some wipes around the house to wipe things down every few days, but even though they were a somewhat natural brand, all of those disposable cloths aren't particularly good for the environment. 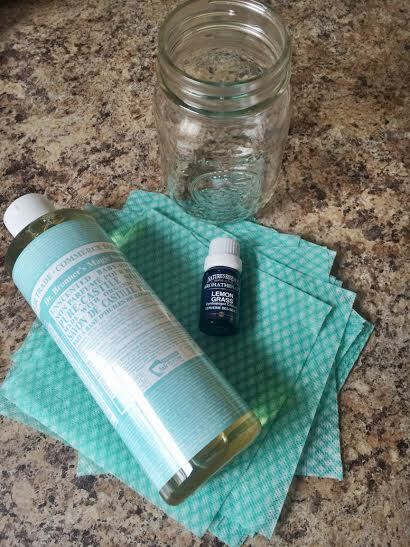 In an effort to be a bit more conscious- and to make cleaning a smaller job- I made these homemade wipes to keep in the bathrooms and kitchen for quick clean ups. Cut whatever you're using for rags into squares. I cut two j cloths into sixteen. Pour one cup of water into a reusable container (mason jar, tupperware, etc.). Add the Castile soap and essential oil. 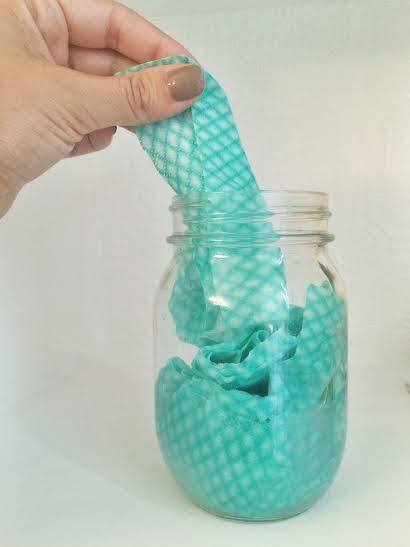 Fold up the rags and place them into the container so that they're soaked with the solution. Wash rag after use and return it back into the solution for future clean ups.